I thank you for your mail and I believe that this relationship we are about to start will stand a test of time. I need a man of understanding and vision,Caring and humor. My name is Amina Ducal, 25 years old girl and single; from Ivory Coast West African. A student of Medical Laboratory in an institution of higher learning. But am out of school because I lost my parents and I hope to continue my studies as soon as I get out of this situation now. Presently, Iam staying in a refuge camp in Dakar Senegal as a result of certain conditions beyond my control. Sincerely speaking I have seen and believe that the world is not always a bed of roses. This has made me to start looking for a way out and at the same time seeking for a good and reliable man for a serious relationship and if you are the right one then count yourself lucky. I promise to give you the best Love you can ever think of on this world. what I only need from you is your kind support, trust and love. Then things will take its natural course. I hope your are a nice person too. I would like to know your likes and dislikes and What you do for a living presently? Please Dear, tell me more about yourself. I would like to know the kind of person you really are ; because I know we are going to meet some day. bit hot over here in Dakar Senegal.just like i told you in my first mail that I'm from ivory-coast, but due to the war in my country, that cost the dead of my father and my mother which made me to stay hear as a refugee. my condition here is terrible Its just like one staying in the prison and i hope by Gods grace i will come out here soon.i don't have any relatives now whom i can go to all our relatives ran away in the middle of the war the only person i have now is Rev John Paul. who is the pastor of the (Christ the king Churches) here in the camp,he has been very nice to me since i came here but i am not living with him rather I'm leaving in the women's hostel(in the camp) because here they have two hostels one for the men the other for women. So what i need from you is, for you to see that this money is transfered to a good account and also to make arrangement on how i will come over and stay with you and continue my life and education. my choosing you is a question i knew you must ask and i think it is a good question.i have two reasons for choosing you, i choosed you because it is the will of God.and i believe knowing you will bring hope back again to my life.my choosing you does not mean i do not have anybody from Africa.i have two uncles,that is my late fathers junior brothers whom i think are suppose to be taking care of me but they do not care,all they did was to sell my late father's houses and company to one Mr Olson Steven from united states and enjoy the money with their wives. I wanted to tell Olson about it but should my uncles know of the money,they can kill me ,so as to eat the money,it was as if my father saw their deed because he told the implication of having a big money in Africa and that was the reason while he made the deposit in Scotland.the day i wrote you first,i picked up three address from a dating site and i prayed over it with my Rev,father.he broth the pieces of papper and wrote the three email address in it and fold it,he ask me to pick one and i picked your email address,then i decided to write you and i also believe that it is the will of God. Tárgy: DARLING CONTACT THIS BANK FOR CONFIRMATION AND POSSIBLE TRANSFER. I believe that you are doing well. As for me iam fine here with all hopes to meet with you immediately after the transfer of my money to your position for a better life. ROYAL BANK SCOTLAND GROUP PLC. NAME OF THE TRANSFER OFFICER IS MR MICHAEL WOOD. governing refugee all over the world states. Pounds deposited by late father of which iam the next of kin afterwhich you call me on phone today. ACCOUNT NAME IS DR ROBINSON DUCAL. NEXT OF KIN MISS AMINA DUCAL . of account number: 43483002 with an outstanding balance amount of lb 2,800,000.00 Pounds. funds to your account / position and you are welcome. deceased and that she has legally present you to stand on her behalf in this transfer. 1. A power of attorney permitting you to claim and transfer the funds to your account on her behalf. 3. A copy of statement of account issued to DR. Robinson Ducal by our bank. copies and they are needed to protect our interest, yours, the next of kin after the claims. These would also ensure that a smooth, quick and successful transfer of the fund is made. Mr. Michael Wood for more directives/clarifications. FROM ROYAL BANK OF SCOTLAND. with joy and I am glad to receive your mail and i appreciate your efforts. How are you doing and how is work, my love? I hope all is well with you as i look towards that lovely day when i will be meeting with the man of my heart who picked me from this refugee camp and promised me a better life. Darling i saw what the bank wrote and i show it to our reverend he promise me by tomorrow he will help us get a lawyer here in Senegal who will help us to prepare the power of attorney which the bank is demanding. and dreams. You are the owner of my heart and I'm really finding love itself. Even in the darkness of night, I just think of you to feel his light and love from this world I drift feeling as if I never touch the ground again . You hold the key to my happiness, and it is always my soul you demand. Your voice has the power to heal the wounds within me and gave me to leave the pain of yesterday. You showed me that the past can no longer obstruct the things we hope to achieve my love. I am very grateful to all its efforts and that the good lord bless you. Tárgy: DARLING CONTACT THIS LAWYER. As for me Iam fine here with high expectation to meet with you immediately after the transfer of my money to your account. My dear i appreciated the way you are handling this transfer of my money to your position pending my arrival to meet with you to start a new life with you and whatever you know is the best, I believe in your abilityand trust. God will bless and reward you for taking good care of an orphan and i will equally pay you back your good gesture. I am an innocent young girl that will like to be part of you immediately after the transfer of my money to your position so that i can come over to live with you for a new life. I am suffering here in the prison called refugee camp .I can see what the bank is demanding before they will transfer my money to your position. Presently i have my late father death certificate and statement of account with me here which i have given to the lawyer to send to you when you contact him. After going through your mail i discussed it with Rev John Paul and he gave me the contact of this lawyer Barrister John David. He is one of the lawyers working with the united nations here in dakar senegal.I will want you to contact him on both phone and e mail telling him that you are my foreign partner that you need his services to prepare a power of attorney that will enable you transfer my 2.8 million Pounds from ROYAL BANK OF SCOTLAND to your account on mybehalf due to my refugee status. DR. (BAR) JOHN DAVID CHAMBERS AND ASSOCIATES. WITH REFERENCE TO YOUR MAIL RECEIVED BY OUR NOBLE LAW FIRM ON THE NEED TO PREPARE A POWER OF ATTORNEY IN YOUR NAME AND TO ENABLE YOU STAND ON BEHALF OF YOUR PARTNER MISS AMINA DUCAL AND TO TRANSFER THE SAID AMOUNT OF MONEY TO YOUR ACCOUNT. TOMORROW MORNING , I WOULD GO TO THE FEDERAL HIGH COURT TO FIND OUT THE COST OF AUTHENTICATION OF THE POWER OF ATTORNEY AND THE STAMPING DUTY BEFORE IT BECOMES VALID FOR THE TRANSFER OF THE MONEY TO YOUR ACCOUNT AND THEREAFTER MY LAW FIRM WILL CONTACT YOU BACK WITH THE REQUIRED COST BEFORE PROCEEDING TO RENDER THE NEEDFUL LEGAL SERVICES. THANKS. BARR. (Dr) John David. (ESQ) PRINCIPALES. I thank you so much for contacting the lawyer, This is showing that you really love me and want me to be with you. I was very much impressed for your effort. Darling, I don't have a passport now, I lost my passport during my struggle to leave my country for my dear life. But please, I will like you contact Rev. John Paul through his e-mail address : reverendjohnpaul@mail.com asking him to assist us and find the cost of getting a passport for me here and my coming to stay with you ; or if you want me to ask him about getting the new passport myself , please let me know and I will do it ; and in my next mail I will be able to infrom you on that. He would assist because Reverend is kind and besides our movement is restricted in the camp. So how is life with you today and how are you getting on with your work? i hope that you doing very fine. My love try to get me posted when you hear from the lawyer. DR. JOHN DAVID CHAMBERS & ASSOCIATES. LEGAL FEES FOR THE POWER OF ATTORNEY. Sequel to the need for preparation of power of attorney in your name and your partner Miss Amina Ducal and to enable you stand on her behalf to transfer the said amount from Royal Bank of Scotland to your account in your country orelsewhere. Prior to my inquiries from the Bank and High Court , I understood that there are three documents required before the Bank would transfer the money to your account /positionon her behalf. 1. A Copy of Death Certificate of Late Dr. Robinson Ducal. 3. A Copy of POWER OF ATTORNEY to be prepared on your behalf which would legally enable the Bank to carry out this transactions with you. In view ofthe above and from the inquiries made at the Federal High Courton the preparation of the powerof attorney , you are required to pay a fee of 1,465 EUR for authentication of the power of attorney at the ministry of Justice and 230 EUR for notary stamp Duty at the notary republic before it becomes valid to effect the transfer and the legal processing fee is 400EUR . Thus, all cost totaling to be 2,095 Euro. To speed up the process you are to send the money through Western Union money transfer which is afaster to enable my noble law office prepare and validate the power of attorney in the Federal High Courtand notary republic respectively for the Bank transaction. You are tosend the 2,095 Euro with my name ( Barr. 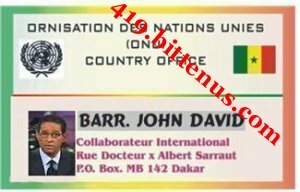 JOHN DAVID ) as the receiver and there after you send an e-mail or call on telephone to in form me assoon as you send the money to enable my chamber collect the money from Western Union office here in Dakar, Senegal. Attached to this mail is my staff identity card and thanks for your anticipated co-operations. Barr (DR) John David. (ESQ) PRINCIPALES. Tárgy: PLEASE MY LOVE AND MY HOPE, HELP ME. I here by wish to inform you that i got your mail and have gone through it with happiness and also with understanding. money which you know that it is only my hope. According to the lawyer he said that as soon as he get this money from you that he will carry on with the preparation of the power of attorney. Darling, you know that there is no other person whom i can go and meet about this lawyer's money so try your possible best to see that you pay him this money. Things may be hard as it is now but believe me that very soon it will be alright, the only thing which will give me joy is to be with you over there which i know that my problem is coming to an end with you. I ddon'thave any thing now to give as an offer but my promise is that we are going to be one and will be living in peace when we are together. How are you today and may the blessings of the Lord be upon you always. Accept my sincere thanks for your kind concern towards helping Ms Amina Ducal to leave the refugee camp and to come over to meet you for a better life. Well, the Amina is a very quiet and a responsible girl, she has a good home training . She is a member of the church choir in the camp. Amina, like the other people here , find theirselves in the camp due to civil unrest and war in their country. So dear to be able to help her to come over to your country , like she wishes to come. You need to assist her to get a passport here for the trip because she doesn't have. So tomorrow, I will go to ministry of internal affairs and collect a request form on her behalf and at the same time try and find out the cost of obtaining the passport for her and there after I will inform on my findings. Thanks for your good gesture. May the Lord give you grace and peace in full measure now and always.